Check out this video, showing highlights from the 2017 excavation! Excavations conducted in the Learnie cave group in 2017 focused on finishing work in Learnie 2B and 2C and starting new open area trenches in Learnie 1A, 1B and 2C. 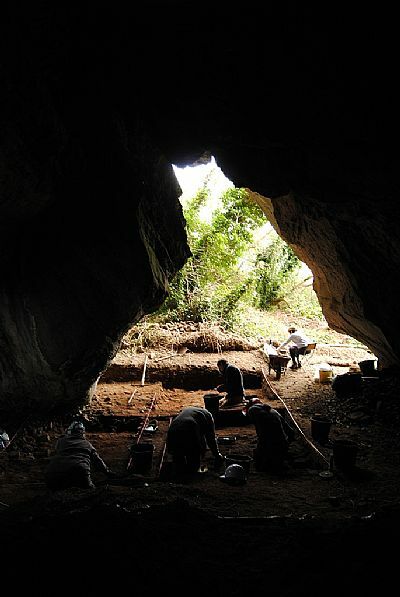 Excavations in 2C were concluded and the results indicate that this long, dry fissure-type cave had been used only for Post-Medieval occupation. In 2B, the trench was extended over the relatively flat apron of ground just outside the cave entrance, revealing only a limited amount of new information in this area. The deep sequence of deposits comprised residues re-deposited outside the cave interspersed with large boulders (rock-fall from the cliff above the cave entrance) and wind-blown sand/sediments. The deposits produced some metalworking residues, mixed midden material, and a number of artefacts of Post-Medieval date. However, the excavations in the back of the 2B, focussed on completing the 2016 excavation area, produced a final perplexing discovery. Within the small excavation area, we uncovered two superimposed Post-Medieval hearths – the upper of which displayed the remains of a stone kerb on the northwest arc. Removal of the ash deposits and kerb defined a rectangular stone setting that contained the almost complete articulated remains of a young cow….minus one half of the lower mandible and cranium. There were no obvious signs of butchery and it was clear that the stone setting had been built over the skeleton. Removal of the rib cage revealed the sole of a leather shoe, while post medieval ceramics and glass sherds also accompanied the burial, proving its age in the overall sequence. 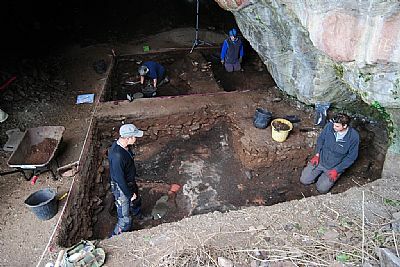 Excavations in the adjacent Learnie caves, 1A and 1B, provided indications of their use during the Post-Medieval, Medieval and Early Medieval periods. Of particular interest are the rich occupation deposits revealed in 1B, dating potentially to the Early Medieval period. This is the largest of the Rosemarkie Caves and we hope that evidence relating to site function will be revealed in 2018. Follow the link to the 2017 fieldwork report. A blog post on the 2017 season's dig can be found here. Whilst below are segments recorded for BBC Landward and Out of Doors during the excavations!